M(i)s Ch(i)ef™: Welcome to Sydney Jamie! 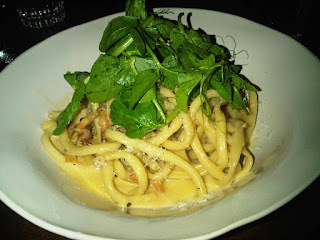 We were trying our luck to get into Jamie's Italian, Sydney's first offering from our favourite chef, Jamie Oliver, on the first Saturday of it opening, but with the no booking policy I figured we had as much hope as anybody. Just for Jamie we agreed to the 30 min wait for a table for 4. As it turned out, a date would have been quicker as there are plenty tables of 2! It was well worth the wait! Being from the UK it was great to have some banter early on with the English bar men, shaking up mojitos and topping up our champagne glass, so the half hour went quickly by. The two level restaurant on Pitt Street is urban chic style - some classy graffiti on the walls, warehouse style decor, and pretty unexpected nestled between the impersonal office blocks flanking each side. Perfect for the casual style of the restaurant. We enjoyed the salt and pepper squid and the Arancini risotto balls as a first course. The pasta - I couldn't get past the traditional carbonara - was deliciously al dente, and apparenetly the sausages were served with the best lentils our friend had ever tasted. With attentive staff, a fun ambience and great food. We would have been happy to hang around, but the theatre called. Anyway, we'll be back and I think it will be a city favourite, a reasonably priced fun and delicious restaurant certainly filling a gap and very welcome! i went last weekend as well...there was a long line even at 8pm!! the food wasnt bad for the price we were paying...can't wait to go back and try out the carbonara :D btw, nice meeting u at the conf last time! also cant wait to try out ritual as you recommended!